Pictures from the lines in and near the valley of the River Meuse. 7843 leading the 74341 (Raccordement Vise-CBR - Kinkempois) through Cheratte. 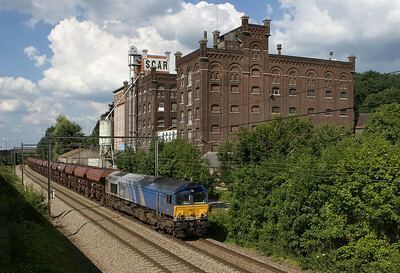 The Wautier limestone works at Hermalle s/Huy on the L40. Cockerill locotracteur at the Wautier limestone works at Hermalle s/Huy. 2151 running light engine has just exited the Geer Tunnel on its way to Vise. The tunnel actually has a "hole" in the middle where part of the roof collapsed, apparently due to quarrying operations on the hill. A similar situation exists east of Aachen in Germany, at the Nirmer Tunnel between Eilendorf and Eschweiler; less than 80 km from here. See this picture for comparison. 7755 leads an empty hotmetal train through Bressoux enroute to the furnace in Ougree. That's the Jupiler brewery in the background. 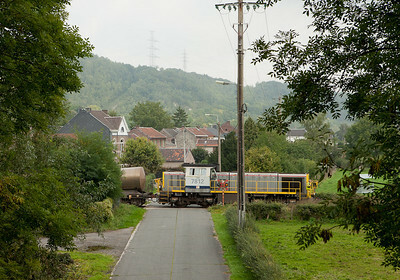 If you look real closely you will see there is a second, loaded, hotmetal train behind it, awaiting its entry to the single main track towards Chertal that the empty train just cleared. 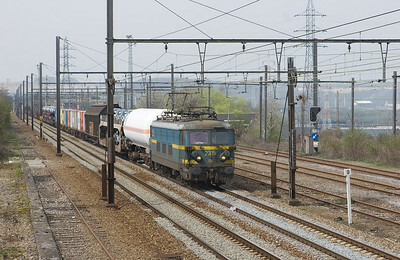 5531 works the coil transload facility at Quay de Renory in Ougree, near Liege. Some of the Chertal steel mill's output is transferred to ships here for the onward journey. This job usually works in the late afternoon and is assigned whatever power is available in Kinkempois. 2315 eastbound with a mixed bag in Vise Haut. A scene unlikely to be repeated. 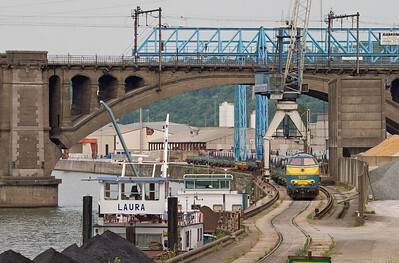 A B-Cargo class 26 brings the empty lead ore train Stolberg/D-Antwerp westbound across the impressive bridge spanning the River Meuse in Vise. This service today is run by private operator Trainsport, a subsidiary of the German Rurtalbahn, and looks like this. 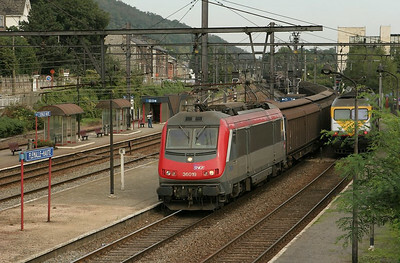 The French Astride engines, close relatives to the Belgian class 13s, routinely come down the Meuse valley as far north as Kinkempois in Liege. Here, 36005 pulls the daily Wembley/GB - Gremberg/D train through Hermalle-sous-Huy. Note the low British profile of the cars compared to the engine. An interesting international assignment for Railion Netherlands' class 6400 MaK road switchers are the limestone trains between the Dutch steel mills at Beverwijk and Veendam and the Belgian quarry operation at Hermalle s/Huy. The quarry is owned by Dumont-Wautier. Here the Beverwijk train 49665's power has cut off their train at Hermalle and prepares to run back to Sittard/NL light engine. Liege is your archetypal steel town. 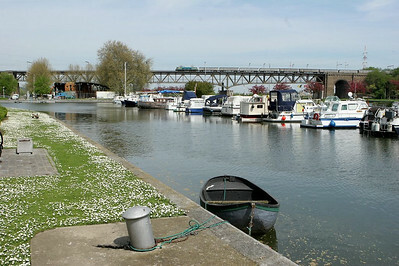 Dams, bridges, canals, railroads, and steel products being hauled through it all. 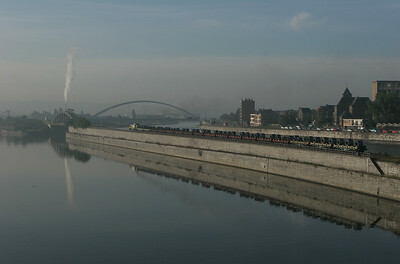 A class 77 leaves the Arcelor-Mittal steel mill at Chertal in the stillness of the early morning, bringing another load of coils to the large classification yard of Kinkempois. 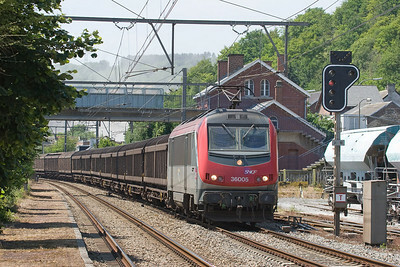 French Astride 36019 brings a Wembley/UK-bound freight through Flemalle Haute. The Astrides (Asynchrone Tritension) are a common sight in French-Belgian service. In the distance the train can be seen swinging off the freight line L125A from Kinkempois. Ex-ERS 6602, now leased by SNCF Fret, leads the 48647 (di,vr Bon 15.45 Std 15.54 Mt 16.15 Fvs 16.30 Vsb - Anglefort Kolen) through Argenteau. 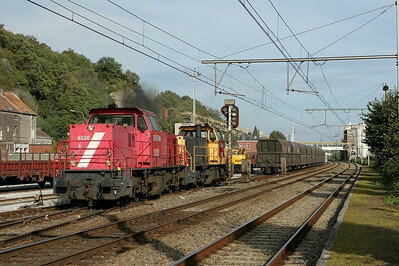 6518 + 6510 lead the empty limestone train 49665 (Beverwijk/NL - Hermalle) through Argenteau in the Meuse valley. 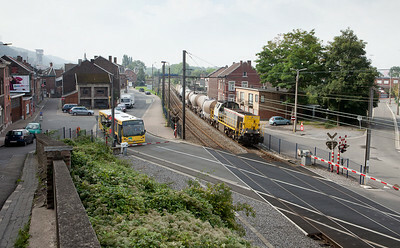 Until the end of 2011 this train usually ran with DBS-NL (Railion NL) 6400s as power south of Sittard/NL. 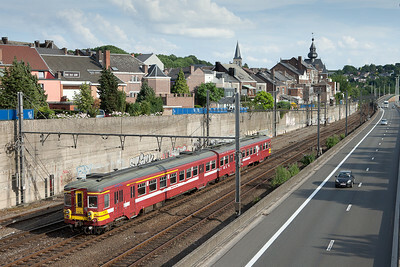 1346 with IC Maastricht/NL - Ostende passes Hermalle-sous-Argenteau. 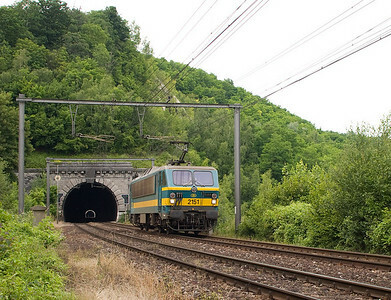 This is probably the most scenic location on the L40, the Meuse valley line. The ICs run in push-pull configuration with a cab control car on the north end and (luckily) the engine on the south end. 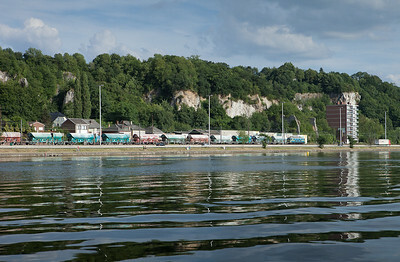 2339 with an empty limestone train in the Meuse Valley is headed up river near Argenteau. 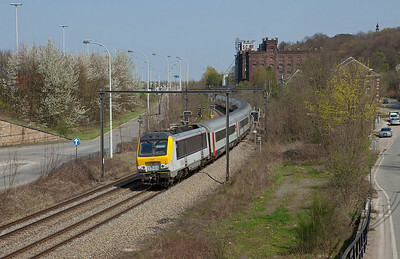 AM62 176 departing the station stop in Vise southbound for Liege. 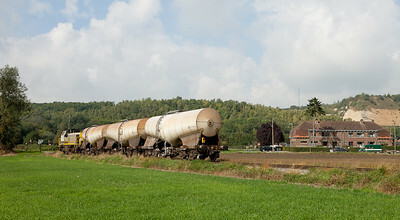 7812 brings the local 74140 (Bressoux - Vise-CBR) through Cheratte-Bas. The building behind the bus is an old fortification guarding the road crossing here. 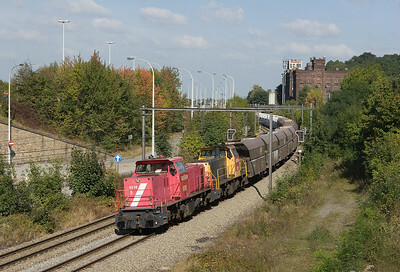 7812 brings the local 74140 (Bressoux - Vise-CBR) past Loëns. 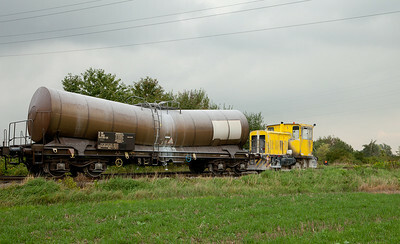 The small Cockerill switcher of CBR in Lixhe. 7812 departs the CBR-Lixhe plant with 74141 (Vise-CBR - Bressoux ) in tow.